If you’re wondering what it’s like to build a new home with the Jones Company of Tennessee, just read reviews left by our customers. We’ve listed a few of the Jones Company reviews and testimonials on this page. From energy savings, to more space for the money, there’s no better value in Nashville new homes than with the Jones Company of Tennessee. The quality and livability (of our home) really stands out! We moved from a 1,700 square foot home built in 2000 to a new 3,000 square foot home and our heating and cooling bill stayed the same! Now there is a neighborhood in which I want to live! In January of 2011, as I was helping my brother-in-law look for houses in the Franklin area, we stopped on WillowSpring Drive right next to Barclay Place. I said, “Now there is a neighborhood in which I want to live”. The charm, the style of the houses and the area were all so appealing to me. Months later, my brother-in-law and sister in law found and purchased a house and I was on my way from Delaware to help them with the move. Little did I know that they had found a house in Willow Spring. Sunday after church, we drove back and stopped in Barclay Place and met Kristin and Patti. They were so kind and helpful. We walked through the models and talked with Kristen and Patti and I was sold. Now all I needed to do was to go back to Delaware and convince my husband that this was where we were moving to. It took some convincing to get a Native of Delaware to think about moving to Tennessee because his wife found the perfect house. With the help of my brother in law and sister in law, my husband was out numbered and the wheels were set in motion. In September of 2011, we came to Franklin for a visit and placed a lot hold at Barclay Place. There were lots of decisions to make and Kristin and Patti helped us with all of them. Most of our business was done from a distance; us still living in Delaware. It only took a phone call and Kristin and Patti were there to help. Well, we are now residents of Tennessee and soon to be residents of Barclay Place. The community, located just west of Franklin, is quaint and has an air of nostalgia. The home styles and small lots give you a sense of city life in the suburbs. The landscaping is beautiful and the park is large and full of amenities. Our experience has been a joy. Kristin, Patti, Will and the Jones Company have been so easy with which to work. Most of the first part of our buying process as I said before, was from Delaware. Either through email or phone calls, Kristin and Patti were always there to answer questions, keep us informed of any changes and allow us to move through this process in a way that suited us. With a house to sell in Delaware, jobs to find in Tennessee, and the entire moving process there are so many details that needed to be kept in check, Kristin and Patti were constantly helping us do just that, making sure we had the correct paperwork in and signed, giving us details of sales and keeping us informed as to due dates. During the construction process, Will and Kristin have been calling us weekly giving us updates on what is happening, even though we are only 1/3 of a mile away. We stop into the model home and speak with Patti or Kristin and ask our questions and within a day we have the answers. No question is too big or too small. They all get answered. We have found working with Kristin, Patti and Will has been a pleasure. They are friendly and professional and do it all with a wonderful sense of humor. It has been a marvelous experience. We are looking forward to moving into our house sometime in November and I know that the process from now until then will be conducted with the same care and professionalism that we have encountered up to now. I almost DOUBLED my sq footage, and still pay 30% less on my power bill! We have a Lot more space, very roomie, comfortable. The plan (The Spruce) affords us a gorgeous layout for entertaining. Lots of light from the windows, huge closets. My favorite place is probably the front porch where I sit in the spring time to enjoy the cool breezes & greet our neighbor. Our family has enjoyed every aspect of our Jones Home, from interactively working with the sales reps to get every amenity that would create our dream home to working with the site manager to get adjustments made while they were building our home. We appreciated that we could get a base house and only add the items we wanted to include rather than settle for items already built into the price. We chose Jones Homes because of the floor plans which included basements, and also the scenic views. We get compliments on our home all the time! It fits our needs and lifestyle perfectly. It is truly an expression of us and we fit well in our home. Our friends and family are all very impressed and we get compliments on our home all the time! Our house is absolutely beautiful and that is all thanks to Renee, Nicki and Darrian. The Jones Company presented a very well planned, scheduled and executed plan for the whole process. Everything was coordinated and communicated well with us. Jessica Martin, Renee’ Quant, Richard Kelton; his crew and the other subcontractors were all very professional, friendly and caring – during and after my house was built. What a great team!! I have an awesome house, but who knew it would come with an extended family! Lots of thanks to everyone who was involved. Richard Kelton is a perfectionist – love it! He made my custom home with two master suites very accommodating for myself and also my mom who as multiple sclerosis. Thank you! We were very pleased and we enjoyed working with our sales associates and builders. They have gone above and beyond with service ever since the closing date. That says a lot about Jones Company. Richard Kelton and John are great people and quality builders who have taken care of issues that we had moving in that were not even their fault. That meant a lot to us. Our movers damaged baseboards in our house and they came over and fixed them for us. It was service at its best and it’s why I’ll be a Jones customer for life. Jessica Martin and Renee Quant were wonderful to work with as well. Awesome experience with The Jones Company! Thank you Kim Barrett, Gary Kinser, Joe Hollingsworth and everyone who worked so hard on our home – we are truly loving it! Thank you for continuing to support the Realtor community. I will always bring my clients in to your neighborhoods because I value a company that is ahead of market trends, stands by their product, builds a quality product, and has great on site agents who are extremely helpful and knowledgable which in turn makes me look good. Thank you for everything you do. We are very pleased with the design and material of our home. We want to thank everyone for their help and understanding during this process. 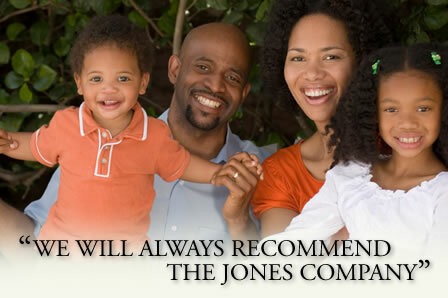 We will always recommend The Jones Company to our friends and family! We have been in our new home in the Bridgewater Community for a month now and we love it! We want to express our thanks to your builder, John and the crew who were extremely helpful, attentive to our needs, and really very friendly to work with. We also enjoyed working with your realtors, Natalie and Jeremy, who went out of their way to make us feel comfortable and well informed in the building process. Still after a month we are still getting the same treatment! We have built a home in the past and our experience wasn’t nearly as wonderful as this one has been. Even the closing meeting was simple and enjoyable. Our home is superb and we love seeing the community grow and develop beautifully! Thank you for everything! We want to write this letter to express our thanks to the people involved in the construction of our home… Many months ago we decided to move from Maryland to Tennessee. After several meetings with agents from different companies and countless hours fo driving around the Franklin and surrounding areas, the results were the same, disappointment and frustration… One day, driving by McKay’s Mill we visited the model homes in Towne Park. Jessica, who showed us the model homes and informed us about the houses in this area, welcomed us… After that pleasant experience, we decided to sign the contract with the Jones Company. By that time, Kim Matthews, who made the effort to come into the office on her day off, started providing us with a very professional explanation about the conditions, steps, required documentation, our role during the construction, follow-up appointments, etc. Overall she made us feel that we found the home of our dreams… Following the schedule we had on the contract, we had the first construction meeting with the building supervisor. Danny, showing a high degree of knowledge, walked us through the entire construction process. Step by step he guided us over the home plans, specifications, and features to be included in our house… We know that Kim, Jessica, and Danny are a few of the many dedicated people that work non-stop making the dreams of several families like us a reality. Once again, thank you very much. We live in CA and recently purchased a home from The Jones Company. When we bought our house we hoped to receive updates on the development of our house as it was being built from our agent. We were a bit nervous about how smooth things would go with this home because we live far and unable to give much time and attention to this project. Kristin Hood has gained our respect and confidence. We are very pleased with her performance. She has treated this deal as if it were her own. She has kept us up to date and she’s gone out of her way to send us pictures. We feel very confident and comfortable with Kristin. We are able to continue to give our attention to our business knowing that Kristin is there to trouble shoot and keep us in the loop. We are very pleased with your company as a whole. We spoke to the foreman before the building began and he too was very knowledgeable and helpful. We appreciate the honesty, professionalism, and integrity. We bought our home in Hudson at McKay’s Mill. On the first day we met two wonderful ladies Renee Quant and Patti Cook in this community. They have the perfect personalities to represent the Jones Company with such integrity and professionalism. Once we met with them, we were confident that we made the right decision to buy our home in this community. We would also like to commend Mr. Donald and his staff for their professionalism and support all through the building process to the level of our satisfaction in a very short time period. I wanted to personally write a letter to you on behalf of my family to express how satisfied we are with our home in Nolen Park. Not only do we absolutely love the floor plan and community, but we love the builders too. Lewis and Jimmy are one of a kind! They have given us what I feel like is exceptional and personal service since the day we moved in, going as far as stopping by and seeing how everything was and to see if we needed anything. Not to mention driving over in a matter of minutes to fix a minor problem. We have never had this kind of quality service from our builders. I could brag on them all day long, but I will keep this letter short and simple. The Jones Company has won us over from now into the future. We appreciate you and your builders. I would like to personally thank you for such a great experience in my recent home purchase at the Villages of Clovercroft. I felt it important for you to know just what a terrific team you have there! I can’t explain how helpful everyone was in assisting me in this purchasing/building process, all the way from the interior decorator specialist to your sales agents and the builder. Just to name a few specifics, Cyndi McKinney was the sales rep I primarily worked with. She was terrific! I appreciated her extra efforts. When I had to pick out brick for the exterior, she was oh so kind enough to drive me around and point out numerous homes in McKay’s Mill that were bricked in some of the same selections available at the Village. She was also always efficient in getting back to me with answers to my questions. I would also like to highlight my builder, Richard Kelton. Let me just say wow, what a great builder! I relied on his knowledge extensively. He’s also been great in calling me back with any questions I’ve had since my home purchase…I just thought the Jones Company should know what a terrific team you have over at the Villages of Clovercroft. I am enjoying my new home tremendously! Thanks to your entire team for making my first “house,” or should I say “true home,” purchase great! I would recommend to anyone to purchase a Jones Company home. We love The Jones Company, and tell anyone that will listen that they too should choose Jones! My experience with The Jones Company has been very satisfactory, I wish I had found them a few years back. I’ve purchased 6 homes in the last 24 years. This was a very pleasant experience. The staff was very nice, tactful and just wonderful! We are very pleased with our new home design, workmanship, materials and the area. Attached is the Home Inspection Report, from yesterday’s inspection. Thanks to you, Rick and the entire team, for all that you do to make the process easier & the service you provide. My house is absolutely great! I really had a great experience building with The Jones Company. Everyone was extremely helpful, especially the builder, who made sure he took care of me. I had great working relationships with the staff and I was very impressed with their efforts to meet all my needs (both before and after I closed). My house is absolutely great! Everything came together beautifully. I worked with a really good team of builders and designers. If I ever built another house, I will definitely be a repeat customer! I’ll be sure to metion The Jones Company in the future to anyone I know that is interested in building a home! Thanks! We had a great experience working with this builder, employees were knowledgable and friendly. This was our 3rd home built, and the best experience. Our actual purchase was delayed because of our desire to live at Del Webb Lake Providence. When we discovered that Pulte was vastly inferior to the Jones Company, we purchased with the help and guidance of Sharon Tucker. Our entire experience with The Jones Company has been great. We continue to be amazed by the high quality of workmanship and materials at Park Run. This is the second home I have had built in the last 10 years. It was a great experience. I am very please with the house. My home inspector informed me that this was one of the best built homes he has seen in a long time. My home is wonderful and I am very pleased thus far! Kim and Gary were wonderful to work with. There were no surprises with anything throughout the process, because they kept me fully informed with any and all updates. Richard (builder) exceeded my wildest imagination as a builder. To be honest, we were looking at custom homes, and when we went with Jones I was not expecting the level of detail, to quality and accomodation, Richard gave to us. Richard is one in a million. I feel like we could not have done any better, we are very thankful we chose Jones and this neighborhood. Jessica (sales) was very knowledgable, available, professional and coureous. She is an ideal employee – she will greatly continue your excellent reputation.